Deal’s Gone Bad has been many things to many people. Watching numerous waves of ska, rock steady, and reggae music rise and fall before them, this is the band you count on to keep going, despite all the odds, membership changes, trips in and out of substance dependence, marriages, and even the birth of a child. For 11 years, DEAL’S GONE BAD has been the reggae pride of sweet home Chicago, evolving with new personnel and new ideas, but never losing the love Jamaican and American soul music, piracy, and the art of intoxication. What you have before you is a solid 8 of those 11 years – you’re holding three albums worth of material featuring Mike Park, Mike Corcoran, Karl Gustafson, Dave Simon, and a large number of assorted hooligans, jazzmen, and drunks. But what you really have is the evolution of the Midwest torchbearers of Jamaican music in the United States. Few others have been around as long, or remain as strong as DEAL’S GONE BAD, and you can consider this compilation the launching pad for the next 8 years – another chapter in the life of Chicago’s finest. You’ll hear swing, 60’s ska, rock steady, bluebeat, reggae, soul, and even Bob Dylan on this record, but what you also hear is a band coming into its own. Tracks: Pirates, Leaving Town, Elephants, Mad At The World, Dirty Old Town, Good Times, fat Cat, Better Off, In The Land Where No One Walks, Stop & Listen, Shiver Me Timber, Little Thinghs, One More Trip, I Remember Now, Time (dub), Dread Rock, Be Mind Tonight, Hang Em High, Masters of War. 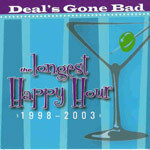 Deal's Gone Bad "The Longest Happy Hour"